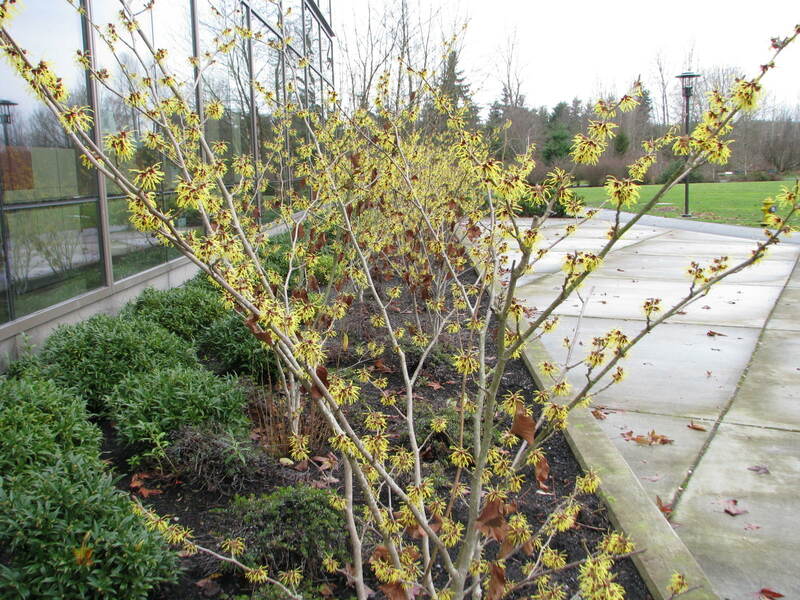 Witchhazel is blooming! Which way does it grow? Up and out, reaching skyward. I saw a plant 20 feet high recently and it was amazing. I did a double switch. Or was it a twitch? It had a big solid trunk and branches that soared over my head. The flowers that slowly uncurl in the cold winter air release a fragrance that will bewitch. This is one of my favorite plants because of that scent. Clean and pure. Biting? Frosty? Full of stardust and moonlight? How can I describe it? Not sweet, neither heavy. Not dark, definitely bright. Lively and light. A winter treasure. The plants in this photo, outside of the city offices in Redmond, Washington are cheery. Where one witchhazel is nice, a long line of witchhazel is joyful. A quote from Dirr’s Encyclopedia of Trees and Shrubs which I agree with…”Great plants and so many wonderful choices, but few customers are in the garden centers to purchase them. A dilemma, to be sure. Every garden needs a witchhazel. Allow me to show and tell…Quite adaptable plants, with minimal expectations of well-drained, preferably acid soils, full sun to partial shade. Flower on old wood, initiating in fall through late winter, depending on the species.” Sometimes the brown leaves hang on all winter and need to be trimmed. Yes, I need a witchhazel. Never leave a witchhazel behind. When I moved last year I dug up my roses, my lily, my lilac, but I left the witchhazel. I decided it was too big and why not leave it for someone else to enjoy? Idiot, delusional, wrong, wrong, I was completely wrong. It was special because it flowered half yellow and half orange. And I loved it. But witchhazel woes, when I passed by months later it was gone. Nothing left but plain brown dirt. Removed by the uneducated, uninformed, unenlightened. It was a very sad day for me. Have you ever left a plant behind? Hoping for the best, but expecting the worst? Oh yes, I left behind several plants in my old garden including a clematis tangutica climbing through an ugly old berberis… impossible to remove. The garden is now overgrown and uncared for! I know your pain! Ohhh, that’s the worst! Who are these crazy grass-loving, witchhazel killing people and what planet are they from?